Is it time to shut down Percy Harvin? Just when you thought it was safe to get excited. Percy Harvin teased Seahawks fans with his brilliance against Minnesota. A one handed grab. A great kick return. We probably won’t see any of that on Monday night against the Saints. Harvin is listed as doubtful, having suffered soreness in his recovering hip following the Vikings game. Nearly two weeks of rest hasn’t put him in a position to practise. That has to be a concern. Even with limited snaps against Minnesota, he’s hurting. If he feels close to 100% over the next 48 hours, can you feel comfortable putting him on the field? And what would his workload be? They might as well turn doubtful to ‘out’. And it’s getting to the point where it might just not be worth the risk over the next few weeks. Instead of going into every game wondering if he’s going to be ready — is it time to face facts? Is it time to shut him down? That doesn’t have to be IR for the rest of the season. Maybe it just means saving him for the playoffs? That extra few weeks can be spent on rehab and practise. It could make a world of difference. You’re talking about five weeks of the regular season plus a possible first round playoff bye. Six total weeks to prepare and get ready. Right now it’s pretty clear he isn’t ready. And I don’t know about you, but I’d rather not spend every week wondering if Harvin is going to make it. As much as everyone wants to see him out there, I also want to see him out there next year and the year after. This isn’t a one year deal. I also appreciate keeping teams in suspense will make it tough for opponents to prepare. But aren’t the Seahawks good enough to win without those kind of shenanigans? While it’s disappointing to get almost no immediate return out of a first round pick plus change, the Seahawks are 10-1 without Harvin. This isn’t the difference between success and failure. There’s no doubt Carroll and co will do the right thing here. I just feel like it’s something we need to embrace. We might not see Percy Harvin again this year. – Matt Flynn, Charlie Whitehurst, Russell Wilson. Three quarterbacks John Schneider liked for the Seahawks. When Schneider misses, he misses. When he hits, he hits. – The more I watch of North Carolina tight end Eric Ebron, the more I like. I’m still generally suspicious of tight ends in the draft (as noted here). Being big and fast isn’t such a big deal in the NFL like it can be in college. Ebron has a shot though. He’s an exciting player to watch. 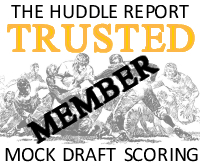 – One tight end I’m not overly keen on is Jace Amaro at Texas Tech. I can’t help but feel his stock is grossly inflated by the stat sheet. Granted, he’s had some productive games this year (albeit in a pass-heavy offense). But talk of him going in the first round seems to be based on little else. And watching him tonight against Texas — I don’t see a first round talent. – Amaro wouldn’t be the first player to gain a production-based boost in November. I’m not convinced UCLA’s Anthony Barr is quite as good as people are making out. He has a ton of upside, he’ll test well at the combine, he has great length and straight line speed. But he still lacks technique, which was one of the reasons I suspect he didn’t declare for the 2013 draft. The team that drafts Barr will be buying potential. He’ll need coaching up though. Ziggy Ansah going 5th overall this year suggests teams won’t run away from this kind of pick. – Teddy Bridgewater, Khalil Mack and Trent Murphy are also being overrated for me. Bridgewater is a very good quarterback, but he’s attained this assumed status as the #1 pick in 2014. I’m not sure about that. He could go in the top ten, but he’s not a no-brainer #1 choice. There are alternatives. Mack looks like a limited athlete who might struggle to have the same impact in the NFL that he’s having in Buffalo. And Stanford’s Murphy, for all his admirable effort and impressive sack numbers, just doesn’t look special on tape. – Yet perhaps the biggest production-based climb is Derek Carr’s sudden ascent. I really like Carr and think he has a shot at making it in the NFL. But let’s be realistic here. He probably isn’t going to be a top-10 pick. It seems a seven-touchdown performance against the might of New Mexico has seen a few people get carried away this week. – Not enough is made of Texas A&M’s Mike Evans. Who wouldn’t want a Vincent Jackson clone? He’ll be a quarterbacks best friend at the next level and should be getting top-ten grades for me. 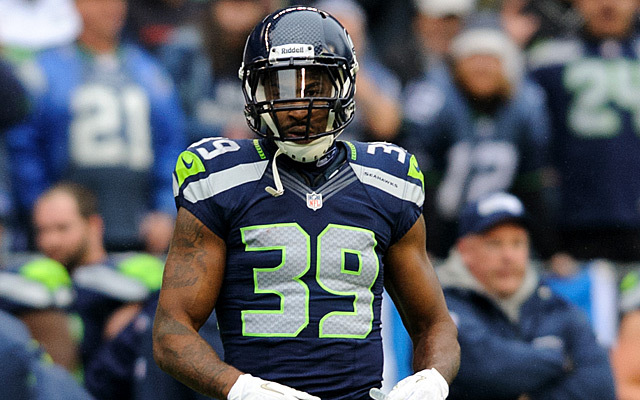 Depending on his appeal, could Brandon Browner stick in Seattle? According to Mike Garafolo, Brandon Browner had his hearing over a one-year suspension today. He is appealing the decision. Now it’s a waiting game. Details are sparse on this case, and I don’t see the value in speculating. All we know is this recent suspension isn’t a PED issue, it’s substance abuse. 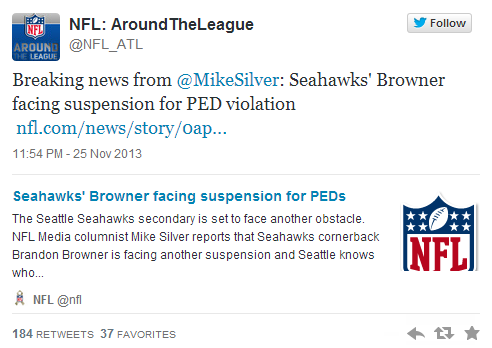 When this story broke Mike Silver suggested the Seahawks were done with Browner. He was finished in Seattle. That may well prove to be true. Think of it this way. There’s no definite date set for a decision to be made on Browner’s appeal. The substance abuse policy says a decision must be reached within a ‘reasonable time’. Pete Carroll has talked this week about giving players a second chance. There’s a supportive vibe there. The message is more about support for both Browner and Walter Thurmond (also serving a suspension). Both players would be allowed in the facility. They weren’t going to relinquish responsibility and simply move on. So what if Browner’s appeal is successful? By supporting the player, perhaps they hope such loyalty pays off. It’s maybe a cynical way of viewing things, but the NFL is a business. The Seahawks have to treat it as such. A cornerback who turns 30 before the 2014 season probably couldn’t expect mega-bucks in free agency anyway. All the controversy and reporting on this recent suspension won’t help. The risk of further suspensions will also add to a major decrease in value. Back a player through a bad patch and you might be able to get another year or two at a heavily discounted price. If his appeal is successful. If. Thurmond is in a similar position. He’ll see his value suffer a hit because of his four game suspension. Yet what benefit is there in burning bridges with a guy who, in fairness, has played well this year? The Seahawks appear to be a very close locker room. Keeping things that way won’t hurt when they go into the negotiating room. That will ring true with both Browner and Thurmond — who is also a free agent in 2014. Alternatively you could argue they don’t deserve any support. Silver’s words might prove true. If Browner is suspended that decision is made for the team. If he’s cleared, why wouldn’t you consider a new contract? At the right price? In Thurmond’s case, it could be argued he’s risked the success of the team with what may or may not be a selfish act. Again, we don’t have the necessary details to make that kind of judgement. We can only really speculate. I’ll say it again, the NFL is a business. Browner and Thurmond — re-signed at a substantial discount — helps Seattle. There’s no lack of detail there. That’s a fact. With cap issues on the horizon next year, nothing can be ruled out. Everything should remain on the table. Including Browner and Thurmond signing new deals. It’s also worth noting — there aren’t any obvious ‘Seahawks’ corners in this draft. I can’t think of a single one currently being touted as an early pick. But 6-4 corners with Browner’s speed aren’t very common. And one final note on this — keep an eye on Byron Maxwell’s performance over the next few weeks. He has the talent. He can make this a moot point by claiming this job for himself. That’s what true competion is all about. Remember — Richard Sherman didn’t walk into the team. He only got a chance to start when Thurmond was injured in 2011. This feels like a big opportunity for Maxwell. Hands up who thought Atlanta and Houston were genuine contenders to own the first pick in 2014? It’s suddenly a reality with five weeks to go in the season. Few teams are playing tougher than Tampa Bay right now (and big props to Mike Glennon who really looks the part), while even Jacksonville have picked up a couple of wins. The Falcons and Texans, meanwhile, appear doomed. And while the players (and coaches) have a point to prove in Tampa Bay and Jacksonville, there’s a definite feel of “what’s the point?” surrounding the two teams who expected to compete for a Super Bowl going into the season. How do you get that motivation back? Is it possible? If you own either of those teams, do you even want to get it back? Both clubs have enough talent to rebound quickly in 2014. Throw in a top-five draft pick (or even the #1 overall pick) and that becomes an even greater possibility. 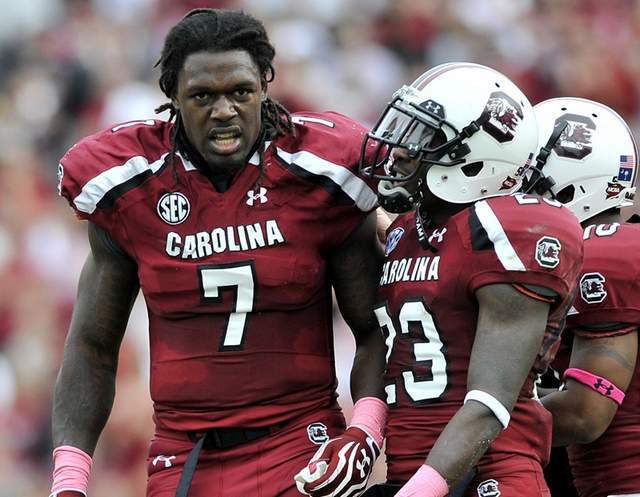 Imagine J.J. Watt and Jadeveon Clowney on the same defense. It could happen. Even if you badly need a quarterback — can you pass on that? If San Francisco beats Washington tonight, the Rams would leapfrog the Buccs and own the #5 pick. Washington’s strength of schedule (0.497) is weaker than Tampa Bay’s (0.571). The funny thing about that list is Cleveland, Buffalo and Oakland are all one game off a wild card spot in the AFC. Had the Raiders beaten the Tennessee Titans yesterday, they would’ve had possession of the #6 seed. Instead, they’re in possession of a top-ten pick. I’m not planning on doing any full first round mock drafts for a while, but here’s an early look at what those teams might plan to do based on the limited information we have. But hey, it’s still early. One suspension is a suspension too many for any team. The Seahawks, for all their positives, have a serious issue on their hands here. And it’s becoming a bit of a farce. Too many players are missing big games. Since Pete Carroll arrived in Seattle, seven (S-E-V-E-N) players have been suspended. Six for PED related issues, and now Thurmond for Substance Abuse. Vai Taua, John Moffitt, Allen Barbre, Winston Guy, Brandon Browner, Bruce Irvin and Walter Thurmond. Richard Sherman also faced a suspension last year, but avoided missing any time after a successful appeal. Yet here we are, seeing another Seahawks player suspended. At a time when Seattle’s football team is 10-1, a legitimate Super Bowl contender and getting praise from all quarters, this issue is threatening to undermine everything they’ve achieved on the field. It’s damaging reputations. It’s already gone too far. And more than anything it’s costing the team. With Brandon Browner out for 4-6 weeks, Thurmond is now going to miss a month. Right before a game against Drew Brees and the New Orleans Saints. Talking guards — the 2014 class and is it a need? To answer the question on whether guard is a need — I don’t think so. Not a crucial need, anyway. But I know a lot of people disagree. I think J.R. Sweezy gets a rough deal from fans, much in the way Breno Giacomini became a bit of a scapegoat last season. Every mistake is accented. We want our offensive linemen to be flawless, when really very few are. I still maintain that every time you don’t notice a particular linemen, it’s probably because they’re doing their jobs. Everyone likes a key block to break off a run, everyone likes to see top-tier pass rushers getting shut out. But it’s the little plays that are the most important. When all they do is follow the script. And for the most part Sweezy appears to be getting the job done. Sure, there are mistakes. What do you expect though? This is his first year as a full time starter. We’re only a year removed from his original switch from defense to offense. I doubt even Tom Cable and Pete Carroll expected the finished product by 2013. Their faith in Sweezy appears to be intact. And because of that I have no reason to think they’ll target a new right guard early in the 2014 draft. On the left side, I’ve actually been impressed with James Carpenter. It can’t have been easy playing next to Paul McQuistan (himself a guard) at left tackle. McQuistan did his best, but when you’re consistently giving up pressure on the left edge, it’ll always leave your guard exposed. Pass protection isn’t Carpenter’s superior attribute at the best of times, mainly because he is a massive human being. I think he’s also lost a step with all the injury issues he’s had. But as we saw at Alabama and now in Seattle, he is a terrific run blocker. And for a team that wants to run all day every day, it’s no bad thing that he’s stayed healthy and got some time on the field this year. He too is making a transition from tackle to guard. Let’s not forget that. And here’s the thing — the line has still performed. The running game has been incredibly productive despite all of the injuries. The pass-pro problems can be placed squarely at the absence of the two starting tackles. For me, the success of the running game can be largely pinned on Cable’s running schemes and the performance of the two guards. I haven’t charted specific plays to give you examples here, but over and over again during games I’ve noticed Carpenter and Sweezy making a big block to spring Marshawn Lynch for a nice gain. You can’t argue with the stats. Seattle runs the ball frequently and productively. They average 148 yards a game — good for #3 in the NFL. Despite the laundry list of absentees. When Russell Okung and Giacomini returned against Minnesota, we also saw a substantial improvement in pass-protection. With Alvin Bailey also capable of playing guard and the general success of finding both Sweezy and Bailey on the cheap, I’m not sure an interior lineman will be considered a priority next year. Even if McQuistan — a free agent — is likely to depart due to necessary cap savings. The biggest problem for me will be the right tackle position. Michael Bowie flashed in some games and struggled in others. I’m not sure whether we’ve seen enough to feel completely comfortable about him being the full time starter. Cable and co may have more faith there, I guess we’ll find out in due course. But if Giacomini has to depart in free agency to save money, the right tackle position becomes something of a priority on a loaded team. Getting someone who can also cover at left tackle — as we’ve discussed — could also be needed to avoid another situation like we’ve seen this season. To add to this, there are many good tackle prospects likely to be part of the 2014 draft. Enough that one or two good ones might just hang around until the late first round. All of this is kind of reassuring, because I’m not a big fan of the eligible guards. Of the group I’m probably most excited by UCLA’s Xavier Su’a-Filo and Alabama’s Arie Kouandjio. Neither is expected to be a first round talent. Su’a-Filo is athletic enough to maybe work into that area, but seems more likely to fall in the rounds 2-3 range. He’s a big time athlete but needs to become more technically adept. It’ll certainly be interesting to see Su’a-Filo battle Arizona State this weekend, including defensive tackle Will Sutton. Kouandjio lacks his brothers upside but would be a solid mid-round selection. Of the others, the hype factor is in over-drive. There may not be a position in football that gets hyped as much as guard. Every year someone will identify “the next Steve Hutchinson”. Very rarely does that prove to be the case. The thing is, it’s a tough position to judge. Tackles can mostly be measured by athleticism and watching them go 1v1 against the big-time speed rushers. It’s hard to make the same judgements on guards. In some cases it can be easy. Last year was unique because we genuinely saw two players who were worthy of the hype in Jonathan Cooper and Chance Warmack. They deserved to go as early as they did. But this year I fear we’re going back to old habits and overrating a couple of guys. Baylor’s Cyril Richardson looks heavy and I’m scared to death of the scheme he plays in. It’s the ultimate spread and usually the ball gets out very quickly. How can you judge pass protection properly? And the way the prolific passing game dominates, it doesn’t half open up a defense inside for the running game. Guys like Jason Smith and Danny Watkins looked great at Baylor, then flopped as first round picks. It doesn’t mean Richardson will go down the same route, but you have to be a little suspicious. He’s massive at around 335lbs and might have some of the same issues we’re seeing with James Carpenter. In terms of body type they look incredibly similar. In terms of lateral agility he looks slow. This is a problem when any pass rusher stunts inside. When he’s not squared up with a guy, he’s sluggish. And more and more NFL teams are using stunts and big time athletes to collapse the interior. I like him against a bull rush or standard straight up block. He absorbs defensive linemen and is rarely beaten in that situation. But as I say, it’s different in the NFL. And he has an obvious weakness when he needs to move around off the spot. He’s a former left tackle. I’m always a little concerned when a guy is considered a better fit inside in college and they aren’t fantastic athletes (like Su’a-Filo). Tackles converting to guards in the NFL I get. Tackles who move inside in college because they’re too big — that’s when the alarm bell goes off. Richardson is tough and appears to love the game a lot more than Watkins, but he might be most effective in the running game where his size and toughness are most effective. If you’re looking for an upgrade on Carpenter in pass protection, I’m not sure this is your guy. Stanford guard David Yankey is another player getting pumped up in the media. I went back and watched the USC tape this week and wasn’t quite as impressed as I was after the first viewing. He pulls well, that’s to be expected. It’s integral to the scheme. David DeCastro did it, Yankey does it. The next guard who comes in at Stanford will be good at it too. It’s bread and butter Cardinal football. I don’t like seeing Yankey pull as often as he does because he’s not going to do it in the NFL. I want to see him lining up 1v1 at left guard, driving people away to open up running lanes and sitting in pass pro. He’s a lighter guy (around 6-4 and 305lbs I’d estimate) so his body type is ideal for protection. Yet when he does go 1v1, he looks inconsistent. He hasn’t got the sheer power to dominate versus the run and he’s far from unbeatable looking after the quarterback. I’d say he’s a pretty good player. But I’d struggle to invest a first round pick in him. He looks like a prospect who could get stronger in the upper body and develop into a decent starter. But if you’re taking a guard early — you want someone who can dominate. Someone who is going to take your line to the next level. Few guys can do that. So right now, I prefer the idea of Xavier Su’a-Filo or Arie Kouandjio in the middle rounds. Either that or I’d consider drafting Notre Dame’s Zack Martin — who I like as a tackle — and move him inside. But I’m not blown away by this guard class on the whole, even if it’ll almost certainly get big licks from the internet draft community — just like every year. I don’t mind the idea of Bailey or Carpenter starting at left guard, with Sweezy continuing on the right side in 2014. There are probably bigger needs and better players out there for Seattle. Watching the Alabama vs Texas A&M game this year, it’d be easy to write off Mike Evans’ performance as a one off. But when he keeps doing it — eventually, you just need to accept he is that good. We’ll hear a lot about Evans’ proposed lack of deep speed, his limited athletic qualities. It’s getting to the point where I just don’t care. If you draft a 6-5, 225lbs receiver you shouldn’t expect him to be lightning quick. As long as he isn’t a complete slouch, you can live with it. What he keeps consistently putting on tape is everything you want from a guy his size. He is the perfect receiver for Johnny Manziel. And in many ways he could be the perfect receiver for Russell Wilson. Manziel runs around like his hair’s on fire. He gets out of the pocket, he buys time. He improvises. And while Wilson is more about controlled chaos, they do share the ability to extend plays when everything seems lost. Evans is adept at coming back to the quarterback. Some receivers just get it. When the initial call breaks down, it’s scramble drill time. And consistently Evans works his way back to Manziel to make a key grab. He finds a way to get open and provide an outlet. His jump-ball ability is as good as it gets. Time and time again Manziel just tosses it up there giving him the chance to make a play. And he does. It’s men against boys out there. He goes up, high points the football and makes the big catches. Evans plays every game like he’s pissed off. His interviews are notoriously curt and to the point. He has a spark to his game, a competitive edge. You want to see that. And while he isn’t Calvin Johnson and won’t be running a 4.35 — there’s enough tape of him running away from defensive backs to at least feel comfortable with that part of his game. Danny Kelly at Field Gulls wrote an interesting piece recently about Seattle’s emphasis in training camp on ‘dominating the red line’. Read the article for the details. Doesn’t it look like Evans fits perfectly with that concept? In the Auburn game (see above) he had eleven catches for 287 yards and four touchdowns. It’s hard to find fault within his game when you look at the 2013 tape. Seattle has some big decisions to make in the off-season. Golden Tate is a free agent, Doug Baldwin is a RFA. They’ve already spent big money on Percy Harvin and Sidney Rice’s contract will make for a lengthy debate. If they keep Tate and Baldwin but lose Rice, it’s still going to be tough to get everyone their touches for the financial outlay. For that reason, a first round receiver might struggle to have an early impact. Yet there’s just something so appealing about Wilson having a guy like Evans to throw to. Someone to really put the icing on the cake for that positional group. The explosive playmaking quality of Harvin and Tate. The consistency and edge of Baldwin. And then the height, catch radius and red zone benefit of Evans. The word ‘unstoppable’ suddenly springs to mind. Imagine seeing Wilson scrambling around but having Evans as that safety net — coming back to the quarterback. Imagine having him in the red zone, having him running that sideline. And imagine a defensive coordinator trying to work out who to double cover between Evans’ reach and ability to high point the ball, and Harvin’s pure game-changing physical quality. Drafting him in round one would be a luxury and it’s unlikely Evans will last deep into the first round (unless he really clocks a slow time at the combine). But if you’re looking for the next big physical freak of nature who comes into the league and just churns out production — Evans could easily be that guy. This is how I see the 2014 quarterback class — no truly elite or obvious number one talent, lots of guys who could potentially start in the NFL. The media has latched onto Marcus Mariota and Teddy Bridgewater. I’m not sure that’s a great idea. Last year they similarly attached themselves to Geno Smith, Tyler Wilson and Ryan Nassib. Matt Barkley, in fairness, had fierce critics from the start. But the other three were highly regarded at various points during the 2012 college season. Funnily enough, Barkley’s biggest critics (eg people like Greg Cosell) rallied behind players like Nassib or Wilson. Nobody came out of the 2013 quarterback class looking good. That doesn’t mean Mariota and Bridgewater are going to sink quite as badly. But it goes to show what hype can do at this time of the year. Mariota is a thoroughly modern day signal caller who moves around, can run the read-option and improvise. In many ways he looks like Colin Kaepernick. Yet Kaepernick has struggled this year in part because he’s unable to sit tight and go through his progressions. It’s the kind of thing Mariota isn’t asked to do at Oregon — he usually (from what I’ve seen) has a couple of reads at best and frequently has a run-pass option. It’s argued the 49ers shouldn’t try to force Kaepernick to be something he’s not — but there’s a reason why they aren’t telling him to become a running quarterback. Sooner rather than later, he’d take a beating too many. That’d be exactly the same for Mariota, especially as a potential top-10 pick. He too would probably have to become a little more traditional, even within the most creative offense. Heck — even Chip Kelly has reverted to a conventional quarterback. And it’s working. You need some balance. Mariota hasn’t got Kaepernick’s arm strength either. So while there’s definitely a lot of upside, there’s also a lot of unknown. Bridgewater is much more orthodox. He’s at his best sitting in the pocket working within a pretty rigid structure. He distributes the ball nicely (although not always perfectly) and has the physical skills to drive the ball downfield when needed. But unlike Mariota, he’s unlikely to avoid a heavy blitz with his legs, get out of the pocket with eyes locked downfield and make a fantastic, improvised play. His upside might always be limited — peaking at ‘pretty good’ instead of ‘outstanding’. The great thing about Andrew Luck, Robert Griffin III and with hindsight — Russell Wilson — was their ability to combine the unorthodox with the traditional. All three players are athletic, have the big arm and make plays when things break down. And yet all three have shown at various times they can also be fairly conventional too when given time in the pocket. I can see a situation where a team like Jacksonville, or Houston, or whoever, sits down at the end of the season and discusses Mariota and Bridgewater. And the conclusion they come to is they don’t know what to do with one and the other hasn’t got a big enough ceiling. And then they see a guy like Jadeveon Clowney sitting there — or one of those many offensive tackles — and they decide to pass. Because at the end of the day, the difference between Mariota/Bridgewater and Johnny Manziel/Derek Carr is minimal. Extremely minimal. In fact you could make a case that Manziel and Carr are superior. Seriously. Manziel makes more mistakes than Mariota, but he can also be a pure magician. That Alabama game earlier this year was the definitive Manziel performance. He kept his team alive to the very last second. He made plays that only he could make. And he had a couple of rancid and costly turnovers. If I’m a coach willing to dabble with the unorthodox — I’d be so much more excited about the Manziel challenge than the Mariota version. It really would be a privilege to take on Manziel — try to limit the negatives and bring out the unmatched creativity. Carr is much less hyped than Bridgewater, but why? Having watched both players, I think there’s a cigarette paper between the two on most of the key skills — accuracy, arm strength, mobility. I actually think Carr is better at going through his progressions. He’s also a much more engaging character, who will blow teams away during interviews. The failure of his brother David in the NFL might linger in a few minds — but the younger Carr isn’t launching an expansion franchise. Well, not if he avoids Jacksonville (sorry, Gus…). It’s still way too early to decipher where these prospects will fall on draft day, but I maintain a Clowney/Carr combo (if possible) is more appealing at this stage than Mariota and whoever else you can get at the top of round two. In terms of the other quarterbacks — A.J. McCarron has a shot to make it but might only ever be another Andy Dalton at best. Zach Mettenberger’s play has really regressed in the last few weeks and it’s hard to see him being anything more than a mid-to-late rounder. And Tajh Boyd is another who’s falling — he just misses on accuracy a little too often. I’m starting to really like Eric Ebron. But then there’s a little voice somewhere offering words of caution. Too often we get a tight end who flashes a few big plays. We assume that any player in the 250lbs+ bracket who can move is a fantastic athlete destined for greatness. And it never really happens. Then a guy like Jimmy Graham or Jordan Cameron comes along in the mid or late rounds. No real background or hype. Just freaks of nature. And they play as well as any tight end in the league (or in Graham’s case, as well as any receiver period). The Cincinnati Bengals have been bitten by the curse a couple of times recently. Jermaine Gresham looked like a superstar in the making in 2010. Big (6-5), strong, fast (4.66). He’d been really dynamic in college with Sam Bradford at Oklahoma. In the NFL he’s been average. He has only two career plays of 40+ yards and he’s averaging just over four touchdowns per season. That’s not what was expected of the former #21 overall pick. This year they went shopping in the same market and selected Tyler Eifert with yet another #21 overall pick. Same speed (4.66), slightly less size (250 vs 265lbs) but pretty much the same height (6-6 vs 6-5). Eifert was the only tight end from the 2013 class who looked like a top athlete. It’s unfair to judge a player during his rookie season, but so far Eifert has one touchdown and just 377 yards. Not great to be fair. What we perceive as unique athletes with amazing physical skills might actually just be pretty ordinary tight ends. There’s been some speculative and unconfirmed talk that the Seahawks liked Michael Egnew in 2012 — a tight end drafted in round three by Miami. He ran a 4.62 at 6-5 and 255lbs. Looks interesting, right? He has 39 total career yards in two seasons. He has zero touchdowns. So while watching Eric Ebron sprint through the Pitt defense for 58 yards on Saturday, I start to imagine what a difference maker he could be at the next level. I start to wonder if he can match the high standards of a Graham or Gronkowski. And then I think back to the numerous TE flops. The countless average pro’s. I look at the stat charts and see that only the following names are listed among the forty most productive receivers in the NFL: Jimmy Graham (#9), Antonio Gates (#20), Jordan Cameron (#25), Julius Thomas (#32), Tony Gonzalez (#36) and Vernon Davis (#38). Six players. One hall of famer. Five genuine freaks of nature. If I’m spending a first round pick or even an early second rounder on a tight end, they better have the potential to join that list. So for now it’s a case of sitting and waiting to see just how well Ebron (and Jace Amaro, Austin Seferian-Jenkins) perform at the combine. Are they truly going to offer something unique? Or will they just be another overblown, over-hyped big man who can run a bit. More than one person has asked for a comment on Oklahoma State cornerback Justin Gilbert. Unfortunately, I’ve had no access to any of their games this year. That kind of makes it hard to form an opinion. Judging cornerbacks without all-22 tape is notoriously difficult anyway. It’s why I don’t rely on the otherwise fantastic Draft Breakdown videos. They currently have five Gilbert videos available. But what can you learn when the corner is nearly always off-screen? Very few corners play up at the line like Jimmy Smith did at Colorado. He was very easy to judge — physical, tall, fast. He was nearly always on the screen. For others it’s much harder. Gilbert is a player we’ve been high on for a while and a cornerback we graded as a second round pick before the season began. Sized well, he possesses next level ball skills and instincts. Gilbert shuts down opponents in man coverage but also affords potential in zone. During the Cowboys route over Texas the senior picked off two passes, one which he brought back 43 yards for a score. It was the second time this season he returned an interception for a score. Gilbert also adds the ability to impact games as a return specialist to his resume. The senior has all the makings to be a second day pick next May and eventually start in the NFL. This is based on what I’ve seen so far with a slight Seahawks bias. As with Gilbert, I can’t comment on players I’ve not had a chance to study properly. I’ve not included quarterbacks in the list. This isn’t in any strict order either, although it’s fair to say the top three (Clowney, Robinson and Kouandjio) are my top three players viewed so far. I would’ve included Dominique Easley (DT, Florida) but two serious knee injuries have almost certainly impacted his stock.